The implied value per share is one metric used to determine a company’s profitability. 2. How Do I Evaluate Market Share Prices for Common Stock? Investors can analyze a company’s profitability by calculating the implied value per share before purchasing common stock. The implied value per share reveals how much of the company’s profits are flowing down to the stockholders. 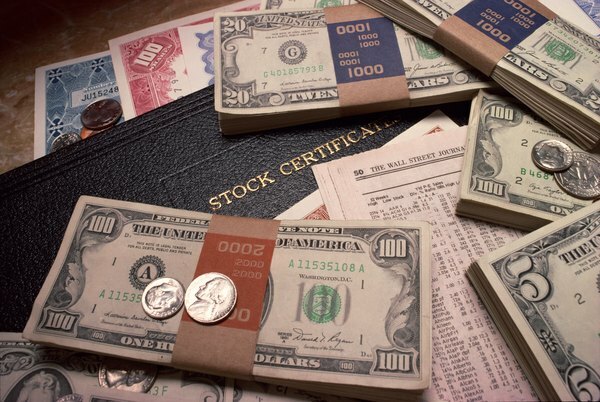 Publicly traded companies report their earnings per share on their monthly, quarterly and annual income statements. In addition to using company-provided information, you can calculate the implied value per share yourself using several different formulas. In order to calculate the implied value per share of common stock, you can divide the company's stated profit by the number of outstanding shares remaining. Better known as earnings per share, the implied value per share tells the amount of earnings you can expect to receive for each share you own. The formula to calculate the basic implied value per share is to divide the company’s profit, also known as the net income, by the outstanding common stock shares. For example, if a company has annual profits of $4 million and has 2 million outstanding common stock shares, the implied value per share is $2. This means that for each common stock share you own, you receive $2 of profit. Many companies issue preferred stock shares along with their common stock shares. In this case, you must deduct the preferred stock dividends from the company’s net income before calculating the implied value per share. The formula is the net income minus the preferred stock dividends divided by the common stock shares outstanding. For example, a company reports annual net income of $5 million, paid preferred stock dividends of $200,000 and has 4 million common stock shares outstanding. The implied value per share is $5 million minus $200,000 divided by 4 million, or $1.20 per share. If a company issues additional common stock shares during the year, the weighted average of those shares is used in the implied value per share calculation. The shares are time-weighted based on the fraction of the year the shares were issued. For example, a company has 1,000 shares outstanding at the beginning of the year. It issues another 3,000 shares on July 1, which means they were issued for six months out of 12. The weighted average for the new issue is 3,000 shares multiplied by six-twelfths, or 1,500 shares. The total outstanding shares are the original 1,000 shares plus 1,500 shares, or 2,500 shares. To calculate the implied value per share for a company that issued additional shares during the year, the weighted average number of shares becomes the denominator. For example, a company has year-end net income of $10 million, pays a preferred stock dividend of $50,000 and has 5 million weighted average outstanding common stock shares. The implied value per share calculation is $10 million minus $50,000 divided by 5 million, or $1.98. If you own 100 shares of stock, your total implied value per share is 100 shares multiplied by $1.98, or $198. What Preferred Dividend Value Do You Use for Calculating EPS?